This is my first post and i need help. I trying to write a program on my Prizm. I am exposed to c++ and python with a hint r. I think my problem is mostly a syntax error, but here we go. This post was in the wrong section so i moved it. So my issue is now that I can jump to the correct section and ask for a new input how would I do a math function on "B", then output the results? Edited by pan.gejt, 20 April 2016 - 03:11 PM. I got that program to work. but I need help for another thing. I think my calculator is "forgetting" the value of A when at the B input. Edited by joshp689, 20 April 2016 - 11:54 PM. I don't know if it's it's the same as the BASIC synntax in fx-9860giis, but if it is, you're missing the ENDIFs or the ELSE. Nevermind, I read some Prism BASIC code, the ENDIF is not needed. Edited by Viliami, 21 April 2016 - 09:34 AM. Is this code correct? Because I don't understand why do you need different values of A for the same jump. In such case you can assign any value to A and omit the code. Edited by pan.gejt, 21 April 2016 - 10:07 AM. 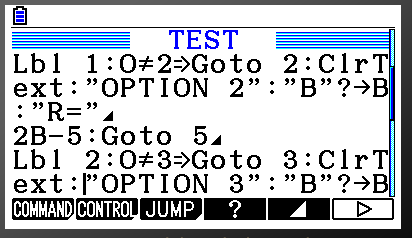 The program is also going to flow to label 1 naturally, so the if statements checking for A=1 and A=2 are not needed. I think, like Viliami you´re missing the endifs. You must look at the user´s guide the syntax of the if then else endif sentence. I've moved the replies from the old topic to this thread, and deleted the old topic. My problem is arguing two variables. 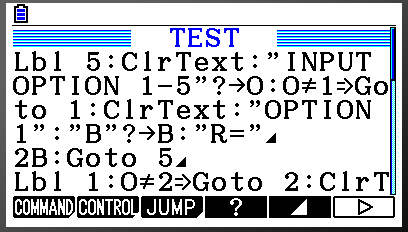 is only display the selected option and to move along to the next menu, after the second menu (Lbl 1). I know I should've added the display part to avoid the confusion. and this needs to move to certain labels based on the combination of "A" and "B". In C++ I would do something like "if A=1 && B=1" but I don't know to how on my Prizm. Edited by joshp689, 22 April 2016 - 04:58 AM. 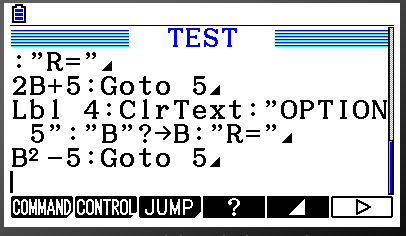 To type the And logical operator press the OPTN button then select LOGIC and then select AND. That is also where you find OR, NOT and XOR. If it isn't showing make sure that COMP is the mode in the setup menu. 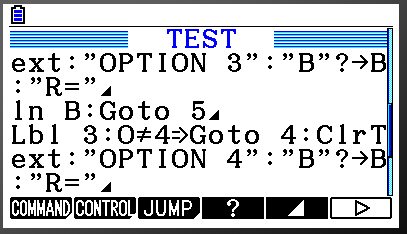 You can reach the setup menu by pressing Shift and then MENU in the maths add-in. Edited by Viliami, 23 April 2016 - 04:16 AM.